As it turns out, Bryan, one of two gay Ugandan men I have raised money for (with the help of very generous friends) is leaving with another friend for South Africa THIS WEEK! I am very excited for him. Harold’s passport is being held up. Practically, this means I could use another $500 for Harold, who will need to make the trip at a later date. The campaign is still on until June 25th, so if you could make small (or large) contributions until then, anything would help. That will be three people saved. I will get Harold out on my own if I must. I’m so excited for Bryan!!! He is leaving this coming week. Thank you, everyone. For more on this story, please go to the campaign to read all about it: We have met the goal but need another $500! 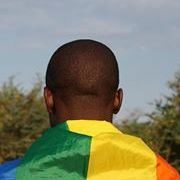 Or, see my post on Lesbian.com about the situation in Uganda where an entire population of people are being persecuted. Previous Is the MFA Worth It? : Guest blog by Message from a Blue Jay Author Faye Rapoport DesPres!